I know the reno isn’t done yet at Victoria Park Station, but the new bus bays are open and the inside of the station itself has most of the ceiling tiles up and is quite a bit roomier then the old station. I think some of the stations are so poorly designed, such as the old Victoria Park Station that the design itself adds to the clutter. Hopefully they put in more of those garbage/recylcling bins at all stations including VP because I think this feature will help put a dent in the amount of garbage and clutter that happens at all stations. I know the TTC has only so much money but I hope more stations get a treatment like VP Station is in the middle of. Not only talking about clutter but the design of the station itself is more ‘ergonomically’ friendly, meaning it is much more fluid now to exit the subway, go down one flight of stairs and have many doors to exit so we aren’t getting crowded with people coming into the subway from the buses at VP station. Also visually we can now see our bus as we near the platform instead of the hidden way it used to be designed. I hope Warden Station gets similar treatment, I really believe (have to wait for numbers to back it up though) that this Station Modernization plan will increase ridership. It really makes both transferring and waiting for our bus that much more comfortable that I think more people will get on board transit. Most people don’t like to feel crowded and ‘packed like sardines’ as they try to catch a connecting bus. I could go on about other stations that need a redesign but I am mostly familiar with Warden Station and VP Station as I use them almost daily, I really think the city investing in the Station Modernization Program, Station Supervisors, and maybe more cleaning staff for the stations will help increase ridership because it shows the TTC is taking pride in its system. I have lived in Montreal, Vancouver and now Toronto for the last five years and one thing that really impressed me about Toronto’s system is the design of a lot of the stations; having the buses and streetcars enter directly into the stations a lot of the times really adds convenience and efficiency of the system. The Station Modernization Program shows me that Toronto is putting a lot of thought into its stations compared to the other cities I have lived in. And yes I do hope for expansion of the subway but I think that the Station Modernization Program and Station Managers is that the TTC is trying to take care of its existing infrastructure as well. The TTC is a really good system that always needs to be improved instead of just resting on its laurels like it did for many decades I read about. Both Adam Giambrone and Bob Kinnear have voiced their opposition. 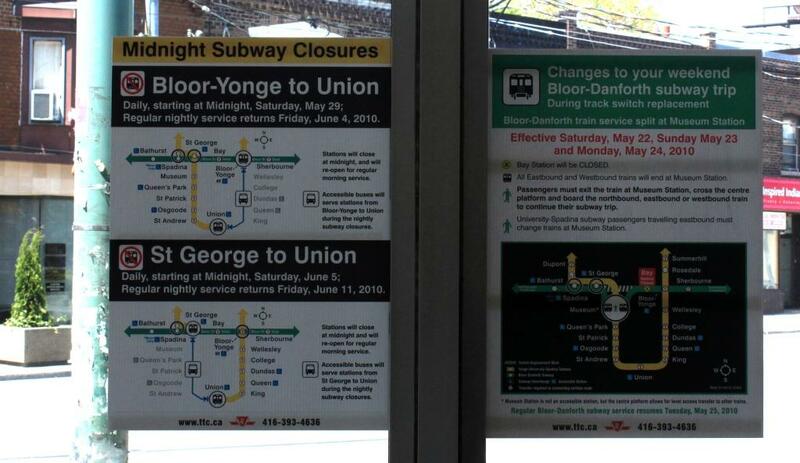 It’s not just the posters that the TTC has a problem with. Many subway cars have the tear away leaflets for the St. George diversion hanging on the hooks. The other biggest problem with out of date signage is for ‘this escalator will be fixed by some date two weeks ago’. I’m not sure that a single one day event is the answer to this. I’d do it as a webpage where faults can be reported at any time, and voted upon so that the biggest faults get the most attention and everything which is wrong can be tracked. For the record, I was holding the visor at the request of the CBC camera, not Joe. Finally, someone is publicly holding the TTC to account about how dilapidated and unkempt our system appears, both in absolute and comparative terms. I know I keep mentioning design, but the sides of the train cars are a good example of where good design, not merely engineering practicality, is important and can help enormously. The thousands of visible rivets on the outside of the cars does little to help the attractiveness of the cars and a very great deal to collect dirt and make cleaning difficult. A quick web search for “London underground train” images will illustrate my point. It’s as though the TTC tried to make their work difficult. Either that, or it was simply expedient to not do design work, in favour of offloading the work to future cleaners, who would seem no longer to be employed. As for the excuse for not painting the cars, it does not seem to have been too inconvenient or expensive for TfL, nor do those paint jobs deteriorate in any meaningful way. As I’ve observed here before, the TTC needs to care about detail, particularly to using design to make the TTC more attractive and more useful to passengers. The same applies to using design to reduce future operating costs. If design can reduce cleaning difficulty and costs, it should do so; if design can reduce the number of calls to the TTC for help using the system, it should do so; etc., etc..
Steve has it right “When the TTC starts to care about its system again,…” but it also needs to demonstrably, consistently APPEAR to care. Only then will more of its public be attracted to a system that then appears as a viable alternative to other means of transport. I might also help if we had more than the constant stream of platitudes from our politicians, too. It would seem from Steve’s account that Furious George’s ‘announcement’ was a prime example of one of those. At least they seem to have stopped posting notices on the murals at Eglinton West station, although the last time I was by they hadn’t removed a vandal’s sticker. I think the problem with stations is that generally they are designed to look nice and fancy while the politicians are there cutting the ribbons. They are not designed to be easily cleaned and maintained once they are in service. Maintainability is a big issue, a station needs to be designed to have a certain lifespan, say 55 years before needing major work. Refurbishing would take place after 50 years. Each station or group of stations, should have a station manager, the station manager is responsible for making sure the stations under their care are kept clean and in a state of good repair by having an appropriately sized crew of cleaners and basic maintenance staff under their report. If customers of staff notice cleaning or repairs need to be done, they would notify the station manager who gets it taken care of. 1) It’s great to have a way to publically target specific parts of the system (being able to submit photos etc. and have them show up on a list by station with the date fixed) will help the TTC understand what is important for their customers. 2) It’s even more important for them to understand the things that are not working … the number of times I have seen an employee mopping an entire platform with one bucket of water is astounding – I use two buckets to do my kitchen. It’s clear to everyone that fixing escalators should not take more than a night (when was the last time you were at a mall that had any escalators taken apart and lying around). So when Giambrone says they don’t have enough money, he probably should just follow some of the employees around and figure out if they are doing things optimally. Out of curiousity does the TTC have a “schedule” for regular types of maintenance (how often is the floor mopped, buffed, the walls de-“goo’d”, the tracks cleared of papers, the signage checked) … etc. There seems to be a wider issue with transit systems that regular activites that don’t take place every day aren’t properly managed. For examples, stations don’t need a complete scrub-down every day, but they probably do need it once a month – but this doesn’t happen. 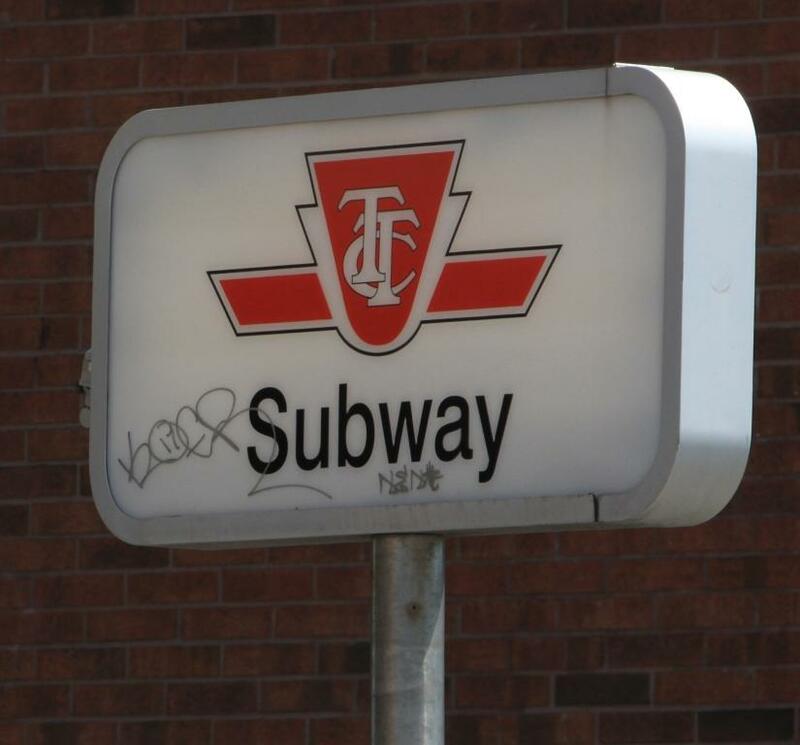 TTC has 69 subway/RT stations, which would imply that every day, two stations need a deep clean. This isn’t just a TTC problem. I have noticed pealing paint and other minor issues at GO stations, where what is needed is for someone to come round once a year and touch it up – but this doesn’t happen. (That said, GO seem to clean/tidy their stations every day). I recently came home late to my local station on the B-D line … and found the night cleaning crew there working. 1) The crew was 2 people, and they were responsible for 4 stations, and worked on 2 of them on any given night. Meaning a station may only given overnight cleaning every 3rd night. There is only overnight cleaning staff 5 nights per week, not 7. 2) I asked about brake dust grime which seems to wander all the way up the surface level ceiling of my station … ruining the paint job. Apparently, I am told this used to be cleaned by the in-house night crew, but because the TTC placed electrical conduits over the ceiling, too many staff refused to power-wash (on a lift), so the work now gets done rarely. 3) The crews used to be 3-4 people with a foreperson (boss) on the crew. Now that crews are 2 people (more crews though) … there is no boss on the actual crew. Instead managers come by periodically to check on work (not every shift). Staff person told me this is a problem because no one working is actually responsible at the time for the quality or quantity of work. 4) Night crews are less than impressed by day crews … Apparently some stations get a full time janitor, most share a janitor with 2 or 3 other stations during the day. The staff I spoke with suggested that the work assigned to day staff was rarely done, leaving night staff to do day staff’s work (garbage/sweeping) which means less time for power-washing and floors. 5) Track-side walls used to be power-washed. Crews used to isolate and shut down the power-rail for that one station (overnight) then power-wash the walls. Apparently this is no longer done for reasons the crew person could not discern. 6) Managers are not former cleaners, and probably never have been and don’t ever pull a full shift with a crew, expectations for work performance and equipment availability do not align with reality. 7) The staff person was very proud of the work he does, though acknowledges that certain things got missed (it never occurred to him to clean the schedule holders). But felt other staff, lacking supervision sometimes did mediocre work. Steve: Thanks for these insights from the front line. Re point 5: I noticed that although power must have been cut at Lower St. George for the Victoria Day weekend while the crossover tracks were under repair, nobody thought to schedule cleaning of the trackside walls which are as dirty as ever. Since Christie is my home station, I’d like to mention that the outside station name sign over the entrance doors doesn’t light up anymore at night (it’s supposed to be backlit), and the steel bracket on the sign’s left side is missing. Steve: For clarity in reading the following, it is a copy of a response to Joe Mihevc’s questionnaire about subway cleanliness. Where “you” and “your” appear, they refer to the questionnaire and the TTC, not to me. Outdated notices. Some are still up about last week’s diversion. 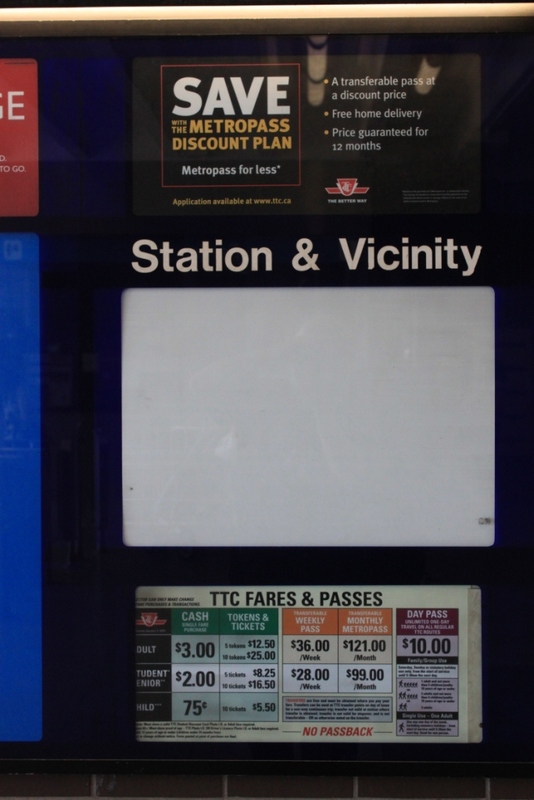 The TTC wonders why their passengers are so “lost” — this is why, when you see out-dated information, you begin to learn to ignore signage. Hand written signs in collector booth windows. While the sign might say “LAST TRAIN @ 1:25” what it says to me is “I, the collector, desperately want to do my job better, but I feel I am being held back my the lack of support from higher-ups who won’t even provide me with something as simple as a printer”. People complain about workers who don’t do their job properly. Lets give them the tools to prove they can. Station Maps. These are not the same maps that you get folded to take with you. Why not? Every time there is a re-print, you need to re-print these special maps just for station walls and bus stop windows? Why? Why not design this little window to display the map you give to riders. The maps go out to each station, surly someone can take 2 minutes before opening time to change the map 4 times a year. Lighting. Some stations, like St. Andrew, blind you with their super-bright LED lights, while others make you feel blind. Why? Simple, some stations are brightly coloured (Queen, or Bloor for example) and hence, reflect light well, while others (like Kennedy, or Lawrence West) are darkly coloured, and hence, absorb light. There does not seem to be any consideration of this when lighting gets installed. Washrooms. Like seriously? The TTC washrooms are disgusting. I would not use the washrooms in Eglinton or Bloor if my life depended on it. Don Mills is the only one I’ve been to that even comes close to acceptable. These washrooms need to be scrubbed with bleach, and power-washed. How ever often you are cleaning them now, quadruple it. Your survey asks if light covers are missing, but ignores when wall and ceiling panels are missing. It asks about graffiti. I’ve been to other large cities, and trust me, graffiti is one of the few things the TTC does well; however, when it appears inside a poorly-used portion of a station, it often remains. I accept some stations like Spadina are very large, but can you not afford to send a worker to each station for a quick walk around each day to note problems like this? You ask if there is garbage on the tracks, almost as if you expect anyone to say no. You also ask people to specify where there is “excessive dirt” without offering them multiple pages (per station) to outline where. Your survey also asks about accessibility. I have perhaps a unique idea. One that a few people have done themselves (though it technically is graffiti). I’ve seen spray painted into the sidewalk, a compass. N, S, E, W sort of thing with arrows. This would be extremely useful, especially in the core (Bloor line in particular) so people can figure out where they are. Remember, accessibility is not only about the differently-abled. Lastly, despite the above, the TTC does a good job on the whole. The TTC’s problem is with specifics. While I don’t doubt that between 9am to 5pm many of the TTC “brass” rides the rails, I do question how many do so outside of regular peak hours. Perhaps a once-a-month session for all TTC managers where they must go to and from random locations at random times will help them understand the problems that we, the travelling public, encounter on a random day. Steve: I was at Bathurst Station yesterday and noticed that someone had printed a notice on plain white paper advising people on the streetcar platform of the time of the last car. The lighting at the south end of St. Andrew includes two types of LEDs. One is a cool white spectrum with a strong bluish cast, and the other is a warm white. Originally they were all cool white, and the difference in apparent colour of the station was quite striking when moving from the original lighting to the LED area, and in a negative sense. Warm colours are important to make the station feel inviting and safe. Also, sadly, at this location is the start of work on replacing the wall covering, a project cancelled due to funding cuts. http://ttcpassengeraudit.com/ is registered to Anthony and not Mihevc, the TTC or the City. 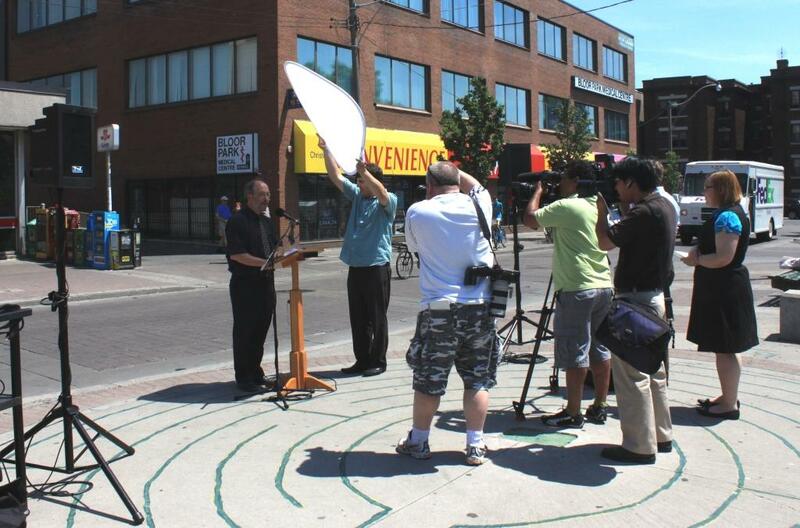 I am going to say that this is a Joe Mihevc and not a TTC thing. Steve: Yes, it is his personal initiative, not an official TTC one. Hey Joe, I am sure you as the TTC Vice-Chair could have access to suggestions/complaints people have made about the stations, if not then I am sure Gary Webster would be able to tell you, correct? I wonder how often YOU take transit … You do know St. Clair West Station is in your ward. Have you ever gone to City Hall using the TTC? Steve: To be fair, Councillor Mihevc can often be found riding the St. Clair car and knows first hand of problems with its reliability. Why are we doing the TTC’s job? (asking volunteers to report on subway stations?) 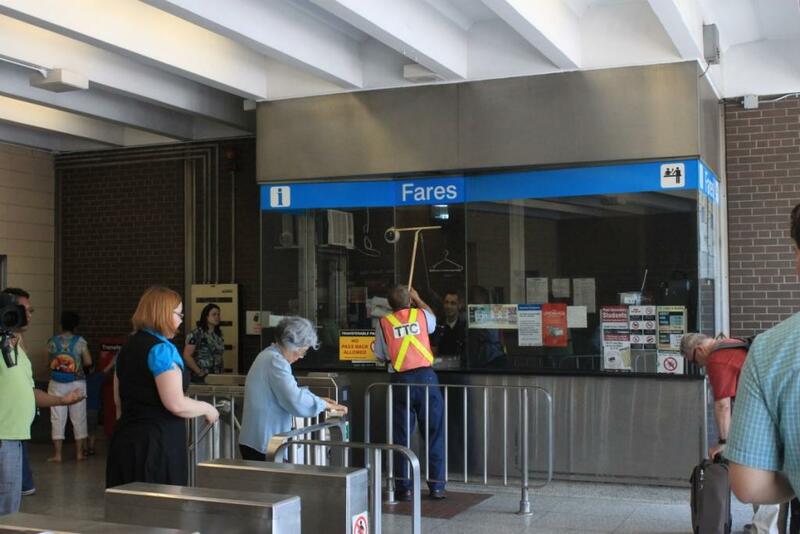 You know the TTC is doing something very wrong when we (the passengers) have to do the report of TTC Staff. You know, you can go through the stations in 2-3 days. There are 69 TTC employees who close the 69 stations. There are 69 TTC employees who open the 69 stations at 6am (9am on Sundays). Can’t the closing employees do a walk around and write a report? Can’t the opening employees do a walk around and write a report before opening the doors on the 69 stations? Steve: Actually, the stations are opened and closed in the wee hours, and this is hardly the time for a collector to spend doing a station audit. We will have to see what the new “Station Masters” bring to the job. Joe can spend 2-3 days going through the stations. What a waste of money for this. 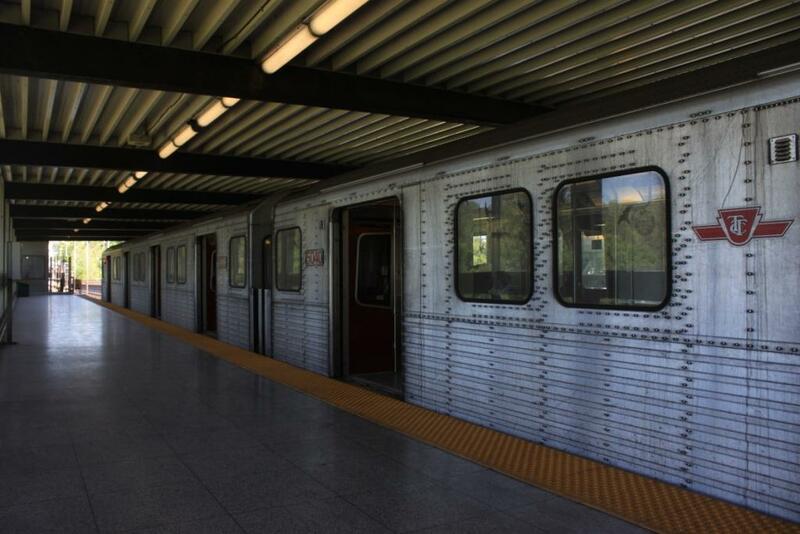 TTC subway cars have rivets because they are made of aluminum which is very difficult to weld. If they where made of steel instead they would be heavier and would have to to painted which would mean dealing with chipped paint and rust and there would be fewer options for cleaning. I understand the TTC uses acid to clean subway cars. Learn about the problems the TTC had with steel Glaucester cars here. It would be good if the TTC published its “Major Cleaning Operations” schedule. With items like cleaning the walls and repainting the ceilings listed. Staff need to sign off that they’ve accomplished each task as required, and it all gets put on a whiteboard somewhere in the station (like most restaurants will have a “last cleaned” board somewhere). This should be included in a passenger bill of rights. What is it with the dirty subway cars these days? It seems especially to be the case with the T1″s. Yesterday I was on a car with a happy face fingered onto the a window from outside. It usually looks black (brake dust?) but yesterday, in the bright sunlight during the slow ride from Keele to Dundas West I could see that it was like fine rust. I did ask Adam Giambrone about it on his facebook site and he said he would look into it. This problem on the Bloor-Danforth line goes back years and years. 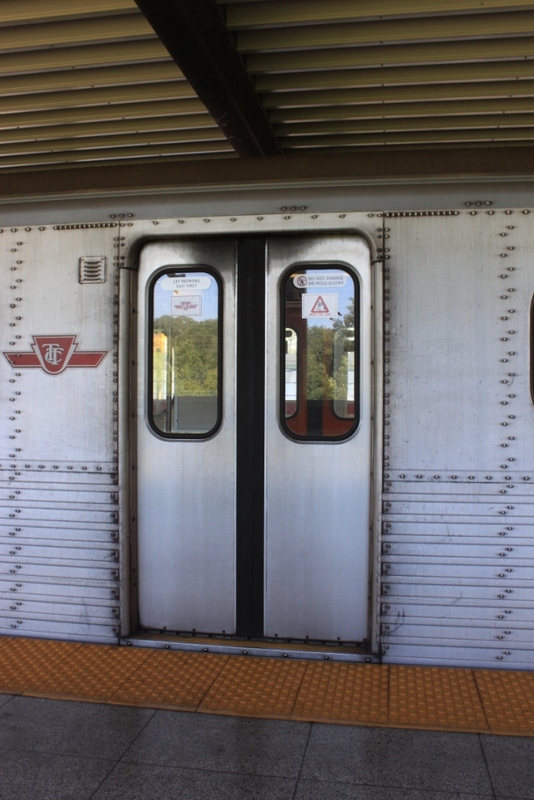 Back in 2000 when I started using the subway regularly and the first of the older T1’s were starting to move over from Wilson to Greenwood, the very first thing I noticed was the filthy state of the exterior of the T1 cars compared to the clean ones on the Yonge line. It’s not enough that the green line gets the hand-me-down equipment but they’re dirty to boot. What exactly is the problem at Greenwood? When Nick J Boragina wrote, “Your survey asks if light covers are missing, …” it reminded me of something from back in 1982. Back then, I was into making 8mm films with another student and I wrote a screenplay about a guy who was bothered about every little thing out of place in his world. We obtained a property permit from the TTC to shoot some parts of this on the Spadina line, and while shooting a shot in the tunnel from one of the parking lots at Wilson, we added an ad hoc scene with the character’s reaction to the occasional missing light cover that was there. Some things never seem to change on the TTC. For those interested, I have a somewhat poor quality clip of the light cover scene uploaded here. The other student I worked with, who shall remain nameless, appears in the clip. A friend of mine (also a transit nerd) from Vancouver who will be moving to Toronto shortly was visiting a few weeks ago, and the experience of showing her around the parts of the system she’d be using right away was eye-opening. After a while you stop noticing all of the places on your daily commute where electrical wires are dangling down from broken segments of conduit, etc., etc., but it’s hard not to see these pathetic state-of-crap-repair issues for what they are when you’re looking at the TTC with a newcomer. You can only say, “they just don’t have any money” so many times before you feel like a complete fool. The rivets are definitely a problem on the subway cars. The older GO bi levels had rivets but the newer ones are welded. I believe that when the workers went on strike at Thunder Bay a few years ago one of the things that they wanted as part of the settlement was for Bombardier to put in equipment that would allow for welded, not riveted seams, though that might have been for stainless steel. It says something about a company when the workers strike for an improved product. They realized that it would make their product more attractive and would result in more jobs for them. GO is very thorough in their station cleaning. The stations on the Georgetown line have the garbage cleaned once a day, the washrooms are cleaned as well as the floors. The windows of the shelters appear to get a regular cleaning as well. GO has a contract with a private contractor to remove graffiti as soon as possible after it is applied. The new Brampton station was vandalized to the tune of about $50 000 according to reports on the long weekend. Large glass panes in the new shelters and stair wells were slashed, lings were broken and racist graffiti supporting the KKK was sprayed in the tunnels and shelters. 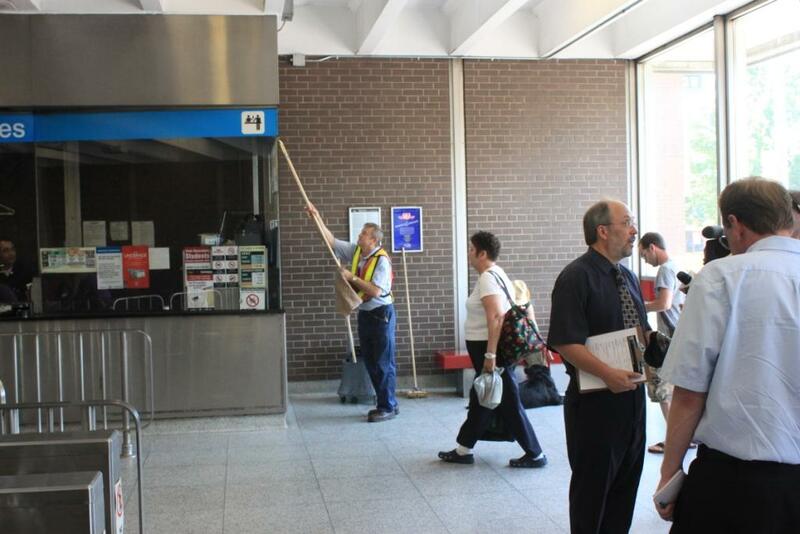 The VIA station agent called GO and they sent out GO police and a cleanup crew on the long weekend. Most of the Graffiti was removed before service started again on Tuesday, portable cameras were installed and several miscreants were captured. Metrolinx may have problems but protecting the image of GO is not one of them. The TTC has to decide that their image is important and spend the money to get everything fixed. Once it is fixed it is much cheaper to maintain it. 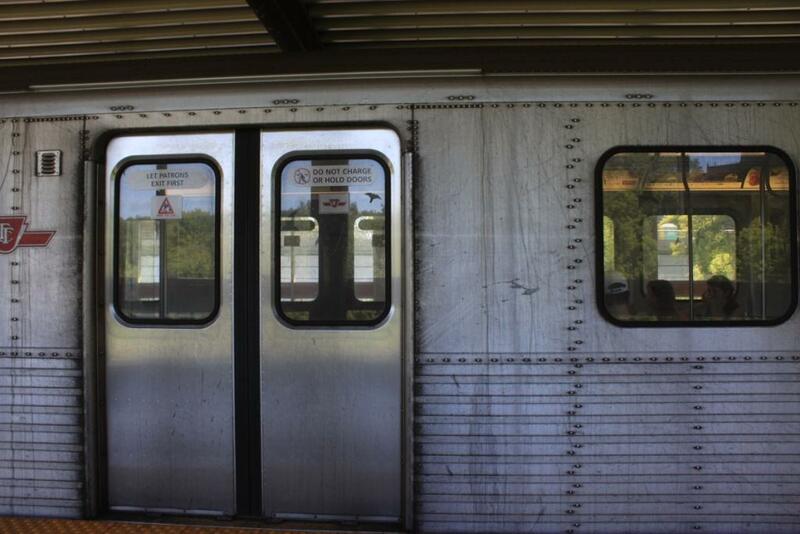 Subway trains don’t suffer from salt spray and road dirt. There is no excuse to let them run around dirty except on the very coldest days of the winter. If the YUS trains are clean and the BD ones are dirty then change Greenwood’s washing schedule to match Wilson’s. Finch station looks like a war zone and it needs to be fixed as it is a major terminal. My wife and I did Doors Open Toronto on Sunday. I parked at Kipling and we took the subway to Broadview and then the street car to the distillery district. From there we worked our way along the water front to Fort York the Ex and finally the Drake and Gladstone. I was going to take the Dufferin Bus up to the Subway and then take it to Kipling. My wife didn’t want to take the subway as she found it dull, dirty and depressing so we took the 501 to Kipling and then the express bus to the subway. I think it only stopped once on the way up. It left the bottom 7 minutes late and was on time at Kipling. I would rather have this than crawl along the street. She found the street cars to be much more enjoyable as the ride was in the sunshine and therefore not depressing. My favourite activity of Doors Open was watching the Canadian Cavalry train in the Horse Palace with sabres and spears. They would ride along at full tilt trying to pick of a small ring from an arm or sponges from the ground with their spears and sabre. It is good to know that we are ready to take on the seventh cavalry should George Custer decide to attack. To be fair it was the Governor General’s Horse Guard, a mainly ceremonial unit in peace time. The captain in charge wasn’t bad but the two cavalry women were quite adept at catching the ring and picking up the sponges. If any one is interested the spears are from Pakistan. Is it wise to get such a valuable piece of military equipment from a country where the Taliban is so active? The Bloor-Danforth fleet’s cleanliness has been several notches below that of the Yonge-University-Spadina (and Sheppard) line’s for a long time. Part of the problem up to the point for the subway trains and stations is the T1 fleet, which has a blended braking cycle with a ratio that leans on the friction brakes pretty heavily. This kicks up levels of brake dust grime that hadn’t been seen since the Gloucesters were retired. Cleaning the train exteriors and the stations has to keep up with that and it isn’t, even though Wilson yard stays on top of keeping the trains clean better than Greenwood. Litter and vandalism are interesting issues because they’re the result of people. The TTC has to stay on top of problems caused by other people in that respect. Sometimes they can be faulted for things like removing all the garbage cans from subway platforms (“Security Reasons” is not a valid excuse for poorly conceived policy in my books so try again) and not repairing vandal damage promptly but at some point, the passengers doing this stuff have to take responsibility for their own actions. The reflector – unfortunately the bright sun combined with the time of day and the location of Joe Mihvec’s event made photography tough. If you look at where the shadows fall on the ground in the pictures, you can tell the lighting’s not favourable at all. That reflector Anthony Schein’s holding up is catching some sunlight and throwing it back on Joe Mihvec so he isn’t totally shadowed by bright back lighting. That’s why the CBC cameraman wanted to use the reflector. As for the comments about riveted aluminum, Darwin O’Connor’s right about the difficulty surrounding welding aluminum. Robert Wightman – the welding equipment that was put in at Thunder Bay’s for stainless steel work. Bombardier’s not going to do welded seams on anything with aluminum – heck, even the aircraft companies don’t. All those airplanes out there with aluminum skins are riveted with those recessed rivets that are flush with the surface to maintain the aerodynamic properties of the aircraft, but they are riveted nonetheless. Can the TTC not have crews at the end stations of the YUS and B-D lines to swing through the cars and pick up loose garbage before the train heads back out? They do this in several other cities. Get Metro and other free daylies to pay for part of the cost if necessary. Sometimes the levels of litter are quite appalling. It is too bad that some people are slobs, but that is just the way society has evolved, unfortunately, and our transit system needs to respond. I have also seen bus drivers do a similar swing through their buses in other cities at the end of the routes, to collect crap left behind by passengers. Steve: There are a few crews who do this, but mainly on the day shift. Also, if a train makes a fast turnaround, they can’t get through all six cars while the train sits in the station. If I recall correctly Bombardier is the third largest manufacturer of air planes in the world, though under many different names. Surely they could figure out how to do a smooth rivet on a subway car. I thought that the welding was only for the bi-levels and other steel cars and not the aluminum subways cars but wasn’t sure. Why do the T1’s have such a high amount of friction braking. It increases maintenance cost for brake shoe replacement, and cleaning as well as reduce the amount of energy recovered by regeneration. Is there something different about their controller electronics? Robert Wightman said: Why do the T1’s have such a high amount of friction braking. It increases maintenance cost for brake shoe replacement, and cleaning as well as reduce the amount of energy recovered by regeneration. Is there something different about their controller electronics? T1 cars are the first model that the TTC has had with computerized brake pressure control. I remember either reading or hearing at a public meeting recently from, I think, Gary Webster, that TTC had only recently discovered that the computer programming for the braking pressure control was not calculating the pressure properly. Basically they didn’t know until only recently… they’ve only had the T1s for over a decade. Did you notice on the supplementary agenda, hidden under 2010 budget update is an item to thoroughly clean every station with temporary staff? Steve: Yes, I saw that but was planning to mention it here after it is actually approved. On aluminium welding… riveting is certainly easier than welding, but it *much* less strong. (In collisions, riveted seams to rip open like the seams o na cheap shirt.) It is only very recently that I’ve seen welded aluminum in train construction, and that is done through friction stir welding. (Wikipedia has a good article on that). An alternative approach is that used on the Pendolino series of trains, made by Alstom, where the body is one large piece of extuded aluminum (yes, seriously)… exteremely strong, as there an no seams. That technolgoy has been around for at least ten years. 1) Flush rivets would cost more. 2) Flush rivets would definitely make it harder for railfans to count the rivets, and we can’t have that. I hadn’t heard about that until now but the thing that kills me is this: parameters like that are variables you configure when you set up the individual parameters in the vehicle’s computer system. Personally, I’ve observed technicians setting up an Alstom Agate logic box using the Agate diagnostic software running on a laptop connected to the Agate box on the vehicle with a serial cable. You could configure various aspects of the vehicle’s performance to fall inside or outside of the acceptable ranges and set the thing up to be a hot rod or a real sluggish turd and favour the friction braking over the dynamic braking or vice versa, and do a lot of other interesting stuff. I wonder if there’s more to the story than that because the T1s should have been set up and maintained over the years according to the equipment manufacturer’s specifications. That almost suggests whoever made the equipment on the T1 cars used a combination of dynamic and friction braking parameters that works perfectly fine for stopping the trains, but doesn’t make optimal use of the dynamic braking. The question of course is why the TTC’s engineering and maintenance folks didn’t realize there was a lot of room for improvement in tuning the T1’s programmable variables to get better overall dynamic braking performance from the blended braking system and get the vendor to work on it when the trains were new. Anyhow, I’ve got to go and miscalibrate some equipment to blow people’s eardrums out so I’m off! STEVE: How do I comment on a new subject? I read where there is some thought of the TTC getting these new pay toilets at subway stations. What a great idea. Here is my thought: Could this be a viable commercial opportunity? A company such as Tim Horton’s or Mc.Donalds etc. could supply and maintain these at subway stations. Pay a Loonie and get access to the toilet PLUS a token or coupon worth 50 cents off at the retailer. Steve: I have moved this comment to a more appropriate thread. There was actually some talk of this at the last Commission meeting, but it didn’t go anywhere. Regarding Nick’s comment about crews at the end point of the line going through trains to do a quick clean: I have seen such people occasionally at Kipling. It always seems to be only one person, not a “crew”. One person generally can’t get through six cars, but they seem to do three or four cars, which is a good start. Regarding signage: How long has it been since the exit to Walmer Road was built at Spadina station? There are still no signs on the platform directing people to it. It’s ironic that one of the reasons for constructing this alternate exit was to improve fire safety, yet in a fire situation, unless you happen to know this station, you would likely not be aware of this exit being available. @ Walt, I remember a picture on the internet showing the exit sign pointing away from Walmer Road Exit. Found myself on an H6 train in the lead car 5817 this afternoon. The windows looked like they hadn’t been cleaned this year. Possibly not last year, either. On the air condition bulkhead, a big patch of adhesive remnant showed where the Ontario/ATU/Toronto sticker once was. The Ontario trillium logo was clearly visible as a cleaner whitish outline in the grey adhesive remnant. Obviously the sticker had come off one way or another and no one bothered to clean the gummy stuff. Wasn’t it back in the Harris years when the “Paid for by Ontario” stickers were all pulled? I was riding on the Bloor line at Spadina and this T-1 came into the station filthier than anything I had ever seen, something is definitely going amiss at Greenwood I guess.. Yes, this is an old thread, but last night I was waiting at Yonge station, when what do you know, 5817 rolled in with “MEAT DEPARTMENT” stuck over the TTC logo on the side of the car, just as I reported on June 7th (what’s that, five weeks ago?). All the windows I could see had scrachitti, and three of the lights were out. At least the automated stop announcements worked properly (or didn’t work at all….I forget….). By the way, I tried to find this old comment, searching on “5817” but got no hits. Why didn’t the search find it? Wilson Carhouse exterior wash track is out of commission due to the carhouse expansion initiatives to prepare the facility for the Toronto Rocket trains. We expect the wash track to be back in service for the spring of 2011. Greenwood carhouse exterior wash track is also out of commission due a construction project to bring the platforms to a proper height to access the trains for interior cleaning. Since this is a project funded by Federal Stimulus funds it could not be delayed. We expect the wash track to be back in service in early 2011. The only exterior wash facility currently available is at Davisville Carhouse. We are doing our best to wash both BD and YUS trains at this facility. All this said, I can’t help getting the feeling that until the question of car cleaning on the BD line was raised as an issue here, the TTC was content to leave things as they were. There has been a decided improvement in the look of trains on that line in past weeks.